With the U.S. wallowing in a financial disaster of its own creation (see sequester, debt ceiling, possible government shutdown and $16 trillion in debt), many Canadians are taking part in the time-honoured tradition of feeling really, really smug about how much smarter we are than the Americans. The United States may be the world's lone superpower and a wellspring of global culture and innovation, but it also has a predictable habit of doing insanely stupid things. It is the role of Canadians, usually forgotten in the shadow of the southern behemoth, to revel in schadenfreude during these moments. So in that spirit, here's a look at nine moments in history when Canada was waaaaaay smarter than the United States. 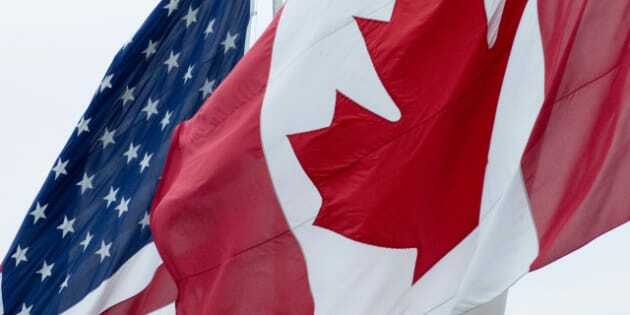 9 Times Canada Was Smarter Than U.S. When Fox won a contract to broadcast the NHL in 1994 it decided people needed the puck to glow in order to be seen. This was stupid. As Canadians know, and voiced loudly, you do not need a laser to see a puck. You just need eyes. The stupidity of Fox's move was immortalized in a Molson Canadian commercial. FoxTrax was retired in 1998, around the time Fox gave up on hockey. America's less-famous first Constitution included an invitation to Canada to join the U.S. It remained open from 1781 until the U.S. Constitution everyone knows was finalized in 1789. A 2004 poll from Leger marketing found just 7 per cent of Canadians were even vaguely interested in merging with the U.S. So obviously, Canada made the right call. America didn't learn its lesson. For proof, see the next slide. While many historians have labelled the conflict a draw, we're not sure how repelling a foreign invader and then burning its national monuments qualifies. And it wasn't all because of luck or American strategic incompetence, although that played a part. Canada also outsmarted the U.S. on a number of occasions. Take the fall of Detroit, when a much smaller force of British soldiers, Canadian militia and First Nations fighters convinced American General William Hull to stand down by using subterfuge. British General Sir Isaac Brock's forces allowed fake letters to fall into American hands. The missives suggested the size of their aboriginal force was much larger than it really was. Militiamen were dressed in the uniforms of British regulars. Encamped troops built more fires than were needed and troops marched in and out of sight of the U.S. fort to create the illusion of a larger army. The result? Hull surrendered more or less without a fight. Brains over brawn for the win. America has maintained a trade blockade of Cuba since the missile crisis of 1962. Canada, not so much. In fact, former Cuban leader Fidel Castro was enough of a friend of former prime minister Pierre Trudeau to show up at his funeral in 2000. While America may have had good reason for maintaining sanctions against Cuba during the Cold War, the fall of the Soviet Union has raised serious doubts about the wisdom of the ongoing policy. While a series of U.S. administrations have avoided angering Cuban expats in the electorally-important state of Florida by maintaining the blockade, they have also passed up trade opportunities that could greatly benefit both nations. On a side note, it's hard to imagine Canadian literary legend Mordecai Richler without his beloved Romeo y Julieta cigars. If Canada had joined the blockade it's possible nobody would have ever heard of Duddy Kravitz. Did we mention vacations in Cuba are cheap and beautiful? While America has been involved in many dubious conflicts over its history, Vietnam is widely considered the nation's greatest military blunder. Despite being closely allied with the U.S., Canada managed to stay out of the conflict. In 1965, prime minister Lester B. Pearson even called for a cessation of bombing in North Vietnam, a move which is said to have angered president Lyndon B. Johnson. Nevertheless, Canada-U.S. relations were never seriously damaged over Vietnam. The period is an enduring example of how two allied nations can disagree and still remain friends. Ten years after the U.S. invaded Iraq, it has become clear that the war was something of a mistake. The rationale to invade was the presence of weapons of mass destruction that didn't exist and the management of the country after the invasion led to bloody sectarian warfare. Canada, despite heavy pressure from the U.S. and a commitment to Afghanistan, stayed out of the conflict. While there are signs Canada is headed for a housing crash of its own in the second decade of the 21st century, it did manage to avoid the crisis of the late 2000s that brought America's economy to the brink of total collapse. Canada avoided many of the questionable lending practices that saw low-income families take on homes they simply couldn't afford. But while Canada avoided the out-of-control leverage that characterized America in the 2000s, Canadians may not have learned the larger lesson. Since the financial collapse, international and domestic observers have grown increasingly concerned that Canada is headed for a housing crisis of its own. The federal government has made it more difficult to get mortgages with long amortizations and discouraged banks from lending at ever lower rates. Whether these moves will be enough to allow Canadians to continue to boast of their financial crash superiority remains to be seen. America's national debt stands at roughly $16 trillion and climbing. Canada's national debt is roughly $600 billion. Even after adjusting for the U.S. population being nearly 10 times that of Canada, it's clear which nation is doing a better job at keeping debt under control. The situation isn't an accident, but a result of policy. In this case, smart policy from Canada and a near total lack of policy from the U.S. In the mid-90s, Canada significantly lowered its debt-to-GDP ratio through stiff cuts. While the cuts brought economic growth to a crawl, they were seen as necessary by the Liberal government of the period after Canada's credit rating was downgraded by Standard & Poor's and Moody's. While the drop in growth lowered tax revenue, nearly to the point of making the cuts revenue neutral, they did shift Canada's economic balance away from the public sector and toward private business, a change credited with contributing to Canada's subsequent economic success. The U.S., on the other hand, took the surpluses of the Clinton era and turned them into massive deficits during the 2000s. President George W. Bush's massive tax cuts, two wars and the financial crisis have left America with a dire financial situation its political system seems unable to address. America's status as the global reserve currency has kept their debt from becoming a lending issue, but almost everyone in the political class agrees something must be done. The bipartisan Simpson-Bowles report commissioned by President Barack Obama in 2010 called for a combination of revenue increases and cuts to programs to alter America's debt curve. Since then, most Republicans have steadfastly refused to trade revenue increases for spending cuts, arguing that cuts to spending and taxes are the way to kick-start the economy. Maybe checks and balances aren't so great after all, eh? Maybe the Founding Fathers should have given the Westminster system and majority governments a shot. It's almost universally recognized that campaign finance has become one of the most detestable aspects of America's political system. Congressmen, senators and presidential hopefuls now spend absurd amounts of time raising cash. The situation has gotten so out of hand that phone-banks are now available just steps off federal property in Washington D.C. so politicians can easily make calls to donors without violating the federal regulations. The cost of the 2012 federal election campaign has been estimated at roughly $7 billion. But even calling it the 2012 campaign is a bit of a misnomer. Campaigning for president never really ends now. In contrast, Canada passed laws banning donations from corporations and unions and setting a low cap on personal donations in the mid 2000s. The Liberal and Conservative parties both were part of the legislative effort. Campaigns are much shorter than in the United States and there are fewer allegations of corporate lobbying. Which way of doing things sounds smarter to you?